Every week, Making A Mark gives an insanely talented artist a little brag-space right here on IADW. 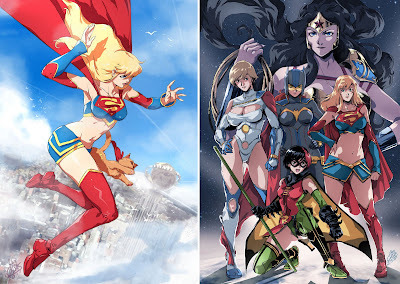 This week, it's the turn of Santi Casas - a Spanish illustrator, whose just as much of a force to be reckoned with in painted works, as he his when he changes gear into Ame-Comi styles and tackles DC's best. As if the colours in his Rom and Galactus tribute to Bill Mantalo wasn't enough, look how he captures the scheming nature of Evil-Lyn! Says Santi on the character "I'm always attracted to the dark side, specially by the evil women. It seems that something always pulls me to the bad chick. But i love it!" For those of you unsure what Ame-Comi is, they are a range of statues by DC Direct, reinterpreting their boldest icons in a more manga-rific way. That said, Santi makes the redesigned statues come alive to the point he even makes Streaky the Supercat look cool - a feat last done by Amanda Conner right back in the pages of Wednesday Comics! Who doesn't like Catwoman? DC need to get this guy on lock for a series of these characters quick! For more of Santi's work, visit his online gallery after the jump. that Santi-Cass ROM/Galactus piece was by far one of the top illustrations in last years Floating Worlds Bill Mantlo fund raising auction. i don't even mind some of the tasteful liberties he took with ROM's armor. Evil Lynn looks pretty good too although her skin needs a bit more yellow to it. 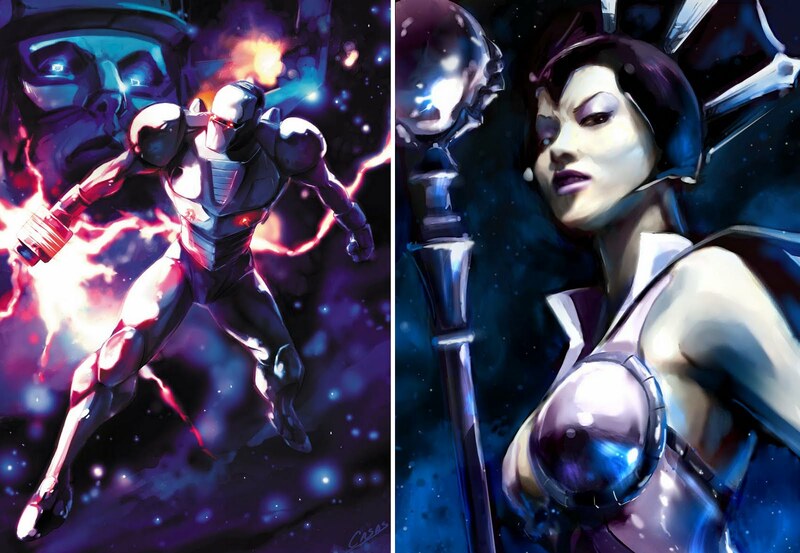 and i wish the colors in that one were a bit more vibrant in general like in the ROM piece. but everything else in it i like especially when you magnify the image. i forgot to mention something in my first comment speaking of Evil-Lyn. there's a funny scene in Green Lantern where Reynolds makes a Masters of the Universe reference. Nice, I like the Catwoman. I think Supergirl looks a little bit like Sailor Moon, though, don't you think? She sort of does yeah, Random. speaking for myself that whole classic anime style adapted for Marvel, DC or even Star Wars never worked for me. it's best left for what it was meant for with stuff like Star Blazers, Robotech and Voltron. Dan, where are you? cmon back to your blog the donkey show was over an hour ago. Thanks for all the comments guys! I loved Santi's portfolio so glad you folks like it too. For me the winner is Evil Lyn - the cold colour only palette really conveys how sinister she is - and that expression on her face is flawless! Funny you mention the Sailor Moon Random - that's just what I thought when I scoped it out too. I thought the same thing of Evil-Lyn too Dave, needs more yellow/green, although she looks like quite the ice queen in that picture. I will disagree with the big guy on the Anime style though. I love the anime-themed Star Wars & Comic heroes.